The Winter 2012 edition of Classic Trains magazine may attract notice on the magazine rack for its cover photo of a Delaware and Hudson PA on the point of the Laurentian (and I know my friend and fellow hobbyist Michel Boucher will pick up a copy), but for me the real prize is found on page 50. That’s where Robert A. Janz writes about working for the Chicago and North Western in the summer of 1952, when he was called to fill in on the Geneva Switch Run, a local that worked a 2.6-mile branch between Geneva and St. Charles, Illinois. 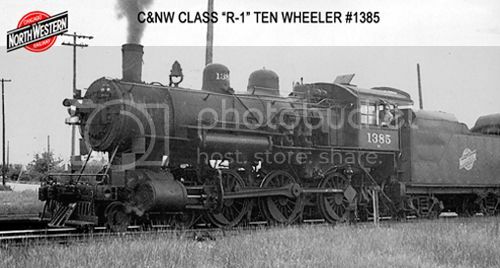 Robert weaves a wonderful tale about working this job – a modest train with a six-person crew, powered by a CNW R-1 4-6-0. As the map in the magazine illustrates, the branch to St. Charles curves northward from the east-west mainline between Chicago and Omaha. It runs up the west side of 7th Street, serving a number of industries en route. At the north end of Geneva, a spur strikes east several blocks, where it curves south again to serve a number of industries along the Fox River. Back at the west side of Geneva, the line continues north through open country to a small terminal in St. Charles, featuring a passenger station, a freight house, and a few more railroad customers. As Robert relates, trains were arranged into four blocks. These were north and south west-side cars in Geneva, east side cars in Geneva, and St. Charles cars. Switching was conducted on the west side, then cars taken over to the Fox River. Cars lifted from east side industries were left on the spur where it joined the main track, to be collected on the way back from St. Charles. The six-person crew was required because there were numerous grade crossings in Geneva (and a few in St. Charles), so this job warranted a dedicated flagman. There was even a bit of middle of the road running. As I read this feature, it occurred to me how similar an operating session would be to my own, Port Rowan layout. A single, short train… a single locomotive… no other rail traffic to worry about… but a lot of thought required to safely and efficiently serve the customers in these two communities. If one used staging to represent the Geneva yard and began modelling the branch just as it left the mainline, it would fit in a relatively modest space in HO scale (or be the basis of a stunning basement endeavour in O scale). Why HO and O, but not S? As always, it comes down to equipment availability. – In HO, Hallmark Models imported the R-1. Perhaps, some day, an S scale manufacturer will consider adding some small steam prototypes to its catalogue. They are definitely more layout-friendly than prototypes such as the Baltimore and Ohio EM-1 (2-8-8-4) monsters that also appear in the Winter 2012 Classic Trains. Definitely worth reading – thanks, Robert, for writing about your experience! The 1/4″ scale R-1 is well done as is the NP S-4. I believe River Raisin has done many of Glacier Park’s HO and O projects in S.
If enough interest is shown, they might consider doing a R-1. Dan Navarre at River Raisin Models is a great guy and has filled in so many of the prototypes that are missing from the S scale catalogue. The scale would be poorer without him, that’s for sure! I have a number of Dan’s models and they’re all top notch. I’m sure if enough modellers approached him to request the 10-wheelers, he’d consider it – he’s always looking for ideas for new models. Another view might be that the S stands for “Scratchbuilt” or “Self-reliant”, although I must admit that I would love a brass ten wheeler in S, having neither room nor inclination towards big locos. Good point – and thanks for making it. I enjoy scratch building – and have done everything from trees to major, multi-structure complexes with full interiors – but I too draw the line at locomotives. S scale (and to a lesser extent, O) suffers from a paucity of smaller steam. 2-6-0 and 4-6-0 models are ideal for more manageable, branchline subjects, where fewer locomotives are required, trains are shorter, and space-eating facilities like yards and engine service facilities are almost non-existent. I’m very fortunate that my chosen prototype has been well-served in S by Simon Parent, who has built lovely CNR 10-wheelers for me. But then again, Simon’s work was a major influence on my choice of prototype: as related elsewhere, I had the locomotives while still working in On2 and when I decided to do something in a smaller scale I naturally picked a prototype based on the motive power I had to hand.